Aldrich actors ready to present Fame Jr.
Aldrich Middle School theater students are preparing to perform Fame Jr. They will be showing the musical on Tuesday, March 25; Friday, March 28; and Saturday March 29. 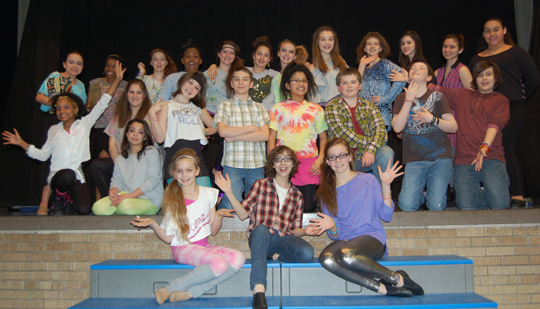 There was hairspray, spandex and side-ponytails whipping in the air Thursday as the Aldrich Middle School Theater students rehearsed for Fame, Jr. The 26 highly energized actors were showing off their vocal and dance abilities in preparation for their upcoming musical. “This is a challenging show because of the complex technical dance numbers. What’s unique about our program is the cast comes up with the majority of the choreography,” said Lori Gustafson co-director of Aldrich Middle School Theater. The musical will be presented Tuesday, March 25; Friday, March 28; and Saturday, March 29. All three performances will be at 7 p.m. in the Aldrich auditorium, 1859 Northgate Drive. The cost is $5 for adults and $3 for kids. Tickets can only be purchased at the door. The musical about students at New York City’s High School of Performing Arts features the stories of dancers striving for stardom. Set in the 1980s students in the upcoming performance have been buying chunky watches, jelly bracelets and more. Gustafson explained this year’s choreography features eighth grader Samantha Grahn, whose been dancing ballet, tap, hip-hop and more since she was 4-years-old. Playing the role of Carmen Diaz, Samantha said, is a great experience as she and Carmen are opposite personalities. “Carmen is all about herself and enjoys the spotlight,” Grahn said. What’s so amazing about the performance, Gustafson said, is how Samantha came up with 90 percent of the choreography, which she described as quite complex. “We are so full of energy, and we still get it done,” Samantha added. Gustafson said sixth grader Audrey McManigle who plays Iris Kelly is the next prodigy of the theater and has been a great role model teaching the other students her dance moves. Gustafson admits she was a little worried last year when her talented group of eighth graders headed off to high school, however she’s been pleasantly surprised with the amount of talent coming in, the new students joining theater and the new energy around the program. Seventh grader Noah Poepping used to be a band kid, but has hopped on the theater path. He got his first taste of theater last year when he helped out with the carpet in a performance of Aladdin. Now Noah credits Aldrich theater for changing his life. “I’m coming here every day and its what I’m looking forward to. We are a family. It’s life changing,” Noah said. Noah, who sang a cappella for his audition, said he had been too nervous to perform before. Now acting the role of Joe Vegas, he’s not shy about his moves at all. Gustafson noted in the past there had been few boys in theater, with the girls having to play the male roles. She said that has changed this year with new numbers of both boys and girls joining.